Complete, bigger & better scans of the same comic uploaded over 5 years ago. Synopsis: Kaänga and Ann meet a man wearing artificial wings who tells them that they are worship by his bird man people. Ann and the bird man are taken hostage by treasure hunters who demand to be shown the way to the bird people's home. Kaänga, though wounded, follows, and rescues Ann and the bird people. The treasure hunters are taken prisoner. Synopsis: Simba prevents Varma killing a lost white child. Varma plots revenge with the aid of the jackals. While the jackals attack Mrs. Simba, Varma makes off with one of Simba's cubs. 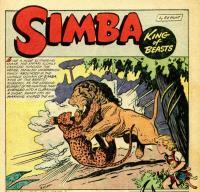 Simba follows Varma and kills him and then leads the lost child back to her father's safari. Synopsis: Brief natural histories of several African cats. Synopsis: Trader Sanders spurs natives to attack the building of an auxiliary fort to avoid lancer investigation of his illicit trading. Terry and the lancers defeat the natives and force Sanders to admit to his duplicity. Synopsis: The Ageelas are driven from their village into Wambi's jungle by the followers of the raider Arungo. 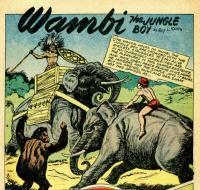 Wambi and Tawn persuade Arungo's elephants to rebel against their masters and drive them away from the Angeela village. Synopsis: Brief natural histories of several species. Synopsis: Otanu seeks to prevent Tongo's ascension to the Membesi throne. He conjures the evil goddess, Shamatar, and promises her a soul in return for her help. 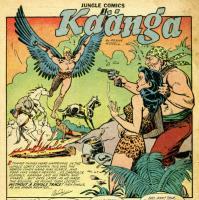 Shamatar sends a leopard to attack Tongo during a zebra race, allowing Otanu to win. Tabu sets a trap to discover who is behind the attack on Tongo with a "truth fluid" that all are willing to drink. save Otanu. When Otanu attempts to flee, Shamatars's leopard attacks and kills him and Shamatar takes his soul as her promised pay. Synopsis: Trivia from the history of Africa. Synopsis: Advice on how to avoid contracting polio from the National Foundation for Infantile Paralysis. 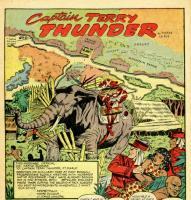 Synopsis: Gun runners kidnap the Masai princess, N'kota, and frame the Ugandis for the crime in order to incite warfare. 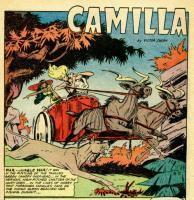 Camilla rescues the princess and stops the impending war. She turns the gun runners over to the Masai for trial.